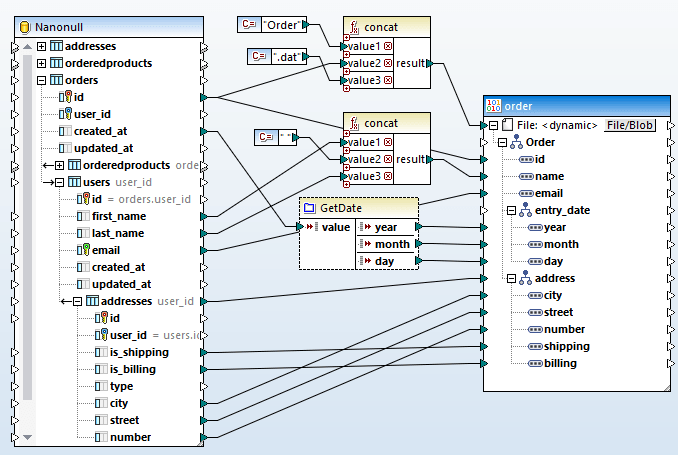 I have written about XBRL on this blog a lot, and you probably already know that we’ve added support for XBRL across several of our products already in version 2009, when we introduced the XBRL Taxonomy Editor and XBRL validation in XMLSpy, added XBRL data mapping and instance document creation to MapForce, and XBRL rendering, report generation, and presentation to StyleVision. The new XBRL Taxonomy Wizard makes extending an industry-standard XBRL taxonomy, or even creating a new taxonomy a breeze. You simply use the File/New dialog to begin a new XBRL Taxonomy Schema, and XMLSpy prompts you to select the existing base taxonomy (e.g., US-GAAP, IFRS, etc.) you wish to extend (if any). Once you enter the company ticker or name, XMLSpy automatically creates and saves all the required taxonomy files, including all the various linkbase documents. In Step 2 of the wizard you get to pick one or more entry points of the taxonomy you are extending. 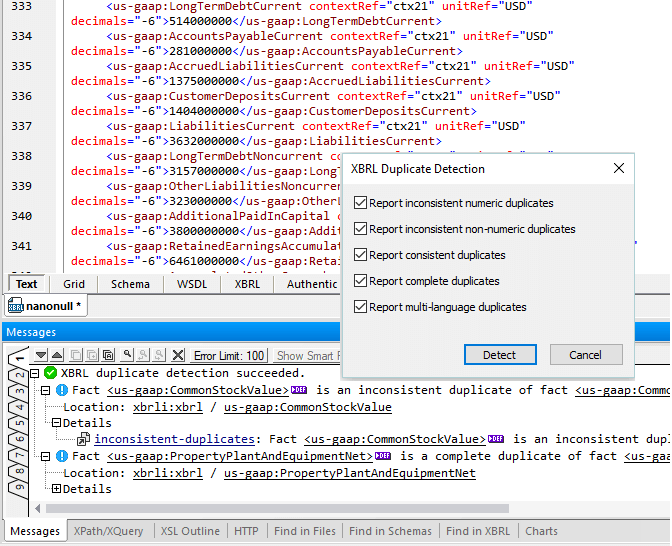 Once you click finish, XMLSpy 2010 displays the newly created taxonomy files in XBRL view, where you can continue editing and refining the taxonomy in a graphical manner. 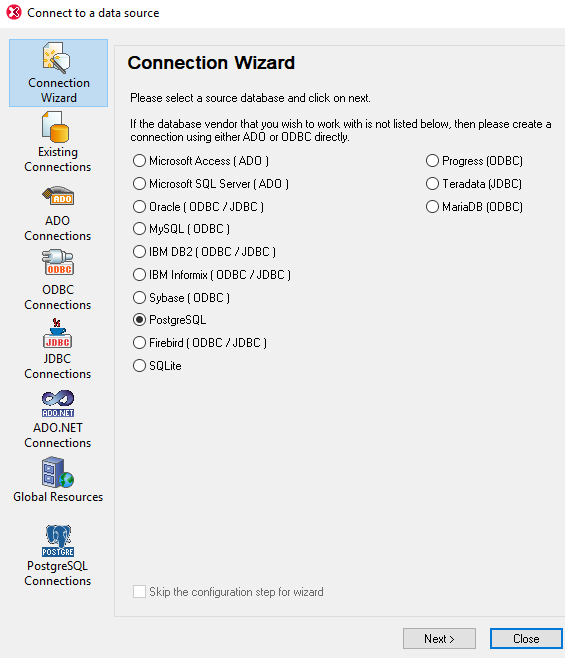 The new XBRL Taxonomy Wizard is an invaluable time-saver when you need to create a new taxonomy for your organization. 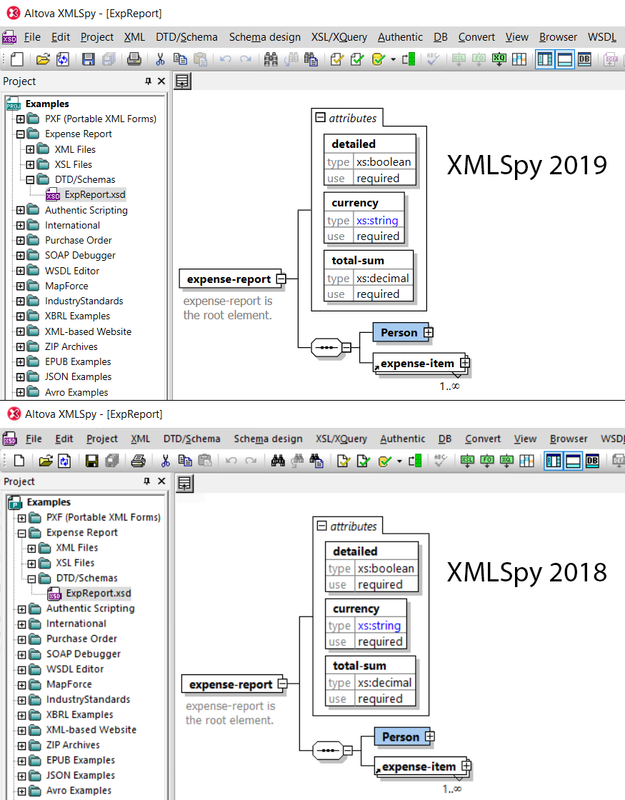 To further facilitate XBRL taxonomy development in its graphical XBRL Taxonomy Editor, XMLSpy 2010 now supports the generation of comprehensive XBRL documentation. Multiple options for what information to include in documentation (below) are available, and documentation may be generated in HTML, Microsoft® Word, or RTF. A snippet from generated documentation is shown below. Related components are hyperlinked in the onscreen output, allowing users to easily navigate from component to component. Generation of XBRL documentation is a must-have feature for anyone creating, editing, or extending an XBRL taxonomy. When working in XBRL View, the new Find in XBRL tab of the XMLSpy 2010 output window (which you can also activate using Ctrl-F) allows you to search an entire XBRL taxonomy or document, with advanced options for narrowing your results. Results are listed in the output window, where multiple tabs let you store numerous queries. Clicking any item in the results window navigates to that specific location in the document. This functionality makes finding information in XBRL files, which tend to be rather large and complex, much easier. The XBRL sorting in XMLSpy 2010 also makes it easier to view and navigate your file in XBRL view, allowing you to sort elements by name, substitution group, or type. For more in-depth XBRL information we offer free online training on our website. Also see this summary of XBRL Tools that we provide to make working with XBRL easier. "From the IT perspective, the formal adoption of XBRL as a mandatory requirement is likely to have a number of implications, not least of which being a suddenly high demand for XML skilled people in general, and XBRL people in particular, as well as a boon for XBRL service providers and tools vendors. As with the OOXML/ODF controversy of 2007, it is very likely that 2009 will be a banner year for XML technologies in general, as two of the key issues that are highly visible this year - financial transparency within corporations and the streamlining of health care, both involve rich XML standards - XBRL for financial reporting, HL7 v3 for electronic health records." I couldn't agree more, which is why we released support for both XBRL and HL7 in our recent v2009 product line. Make sure you read Kurt's entire article, as he has some great thoughts and insight on the current economic situation as well. This past Friday, January 30, the SEC posted its final rule on XBRL, making XBRL reporting mandatory for US companies over a 3-year phase-in period based on company size. The official title of the rule is "Interactive Data to Improve Financial Reporting", as can be seen in the SEC News Digest. According to the SEC this new rule is aimed at "improv[ing] the usefulness of financial information to investors by requiring domestic and foreign companies to provide to the Commission a new exhibit with their financial statements, including the footnotes and schedules to the financial statements, in interactive data format. Interactive data will supplement, but not replace or change, disclosure using the traditional electronic filing formats in ASCII or HTML. Interactive data will be required with a filer's annual and quarterly reports, transition reports, and Securities Act registration statements, and on its corporate web site, if it maintains one. The requirements will be phased in, beginning later this year with approximately 500 of the largest companies." Whenever the SEC says "Interactive Data" it really means to say XBRL. The phasing-in begins this year with public companies that fall into the large accelerated filer category and have a worldwide public common equity float above $5 billion - those companies will need to provide their financial statements in XBRL starting June 15, 2009. The second phase is for all accelerated filers irrespective of their float, and those need to file XBRL financial statement one year later, starting June 15, 2010. All other public companies then follow in the summer of 2011. This is an exciting new development, as it will provide much greater transparency for financial data and give investors and analysts better tools to analyze and aggregate financial data, since XBRL can be processed, transformed, and reused easily - just like any other XML dialect. It will also be exciting to see new tools that will allow software developers to create XBRL content easily, since XBRL has such broad applicability beyond just the realm of regulatory filings. Being able to interchange financial reporting data within larger organizations in a standardized format has huge potential benefits. For other blog reactions, see this article on the Financial Reporting Blog or this article on the Corporate Counsel Blog.